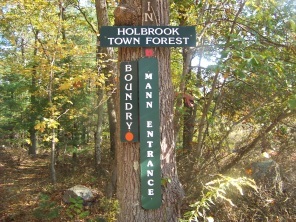 The Boundary Trail is one of the hiking trails in the Holbrook town forest that starts at the Mann Entrance on Pine st in Holbrook. It is fairly long and may be the most interesting. This trail can be a challenge to stay on though. 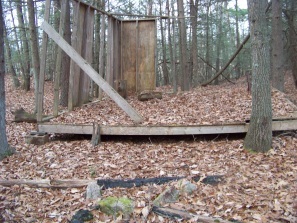 It is quite narrow in many areas and seems to be the least maintained of hiking trails. Many areas the orange circles that mark the trail are either considerably faded or on trees where the mark has worn away leaving only an outline. 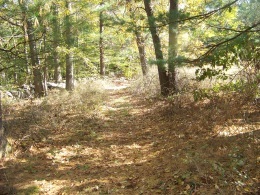 The first part of the trail runs north with the Wiggins Trail through a narrow strip of forest. At the power line the two hiking trails run along together for a short part of the trail. Then the two separate making it obvious that the Wiggins continues into the forest as another sign that marks the trail is posted on a tree. There are no signs or obvious markings for the boundary trail here leaving one to assume the trail continues with the power line. The path of the Boundary trail becomes very faint here. 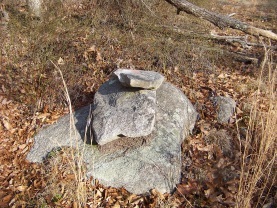 There are no markings till the boundary trail loops into the forest where a small cairn with it's trail blaze faintly painted on top point the way. Some trail work is needed here!! covering any semblance of a trail. but keeping on it (at least in late fall or any leaf less time is a challenge). Your attention will get taken away by a point further down the trail that seems to run on top of a hill. You will almost certainly not notice that a junction of the Elfin Trail enters from the left and Elfin Pond is also comes into sight on the left. At this point the trail runs with Elfin Trail for a time. Again if you are not paying attention you will miss the Boundary Trail taking a right away from Elfin Pond and off into the forest again. There seems to be some sign confusion in the area. You will most likely see a sign that claims that this trail is the Sawyer Trail but that trail is actually down the Elfin Trail further and accessed by a side "leg"trail of the Elfin Trail. 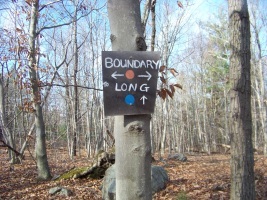 It is at this sign that the Boundary Trail takes its right. or you can continue on. Further down this portion you will find yourself doing a bit of climbing (slight). Again the trail gets narrow and faint at times. 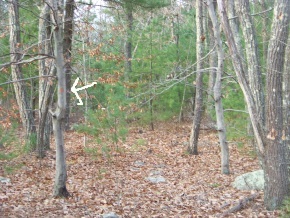 The arrow in this picture is pointing to a blaze on a very small tree. The blaze has faded and become very faint. The trail here also becomes very narrow. The trail seems to end at the power lines like other trails of the Holbrook town forest. Yet there seems to be an older section of this trail that will take you down a hill. It will then continue past what looks possibly like a practice session of some vocational students framing and building job. If the sides were taken down it could be a pretty nice tent platform. 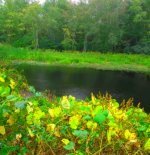 This portion of the trail makes a loop back to an earlier portion of the trail which can be followed back out to the Long Trail. This trail is mostly dry and fairly easy to hike. The real challenge is staying on it. from Boston take route 93 south and route 3 at split. Take exit 16 route 18 south. Right at next intersection onto West st. This becomes Grove at Braintree line. Follow til intersection with Liberty st. This becomes Pine St at Holbrook line. Left at Forest St and right on Park St. to end. 2-3 cars at end of Park St.